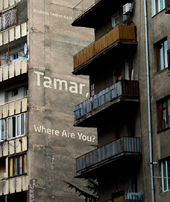 "Tamar, Where Are You?“, a new photo-text-book about Georgia is a collaboration of a German photographer, seven 10 Georgian artists, including Ana Kordzaia-Samadashvili, Dato Turashvili, Dina Oganova, Natela Grigalashvili, Guram Tsibakhashvili, Yuri Mechitov and more. Georgian photographers are represented with their own stories, while authors contributed an essay on Georgia. The project features a foreign photographer's external perspective approaching the country as well as the internal view of Georgian artists through their stories. The German photographer Andreas Oetker-Kast initiated the project. Tamar was the 12th-century queen of Georgia, a legendary figure who led Georgia to the peak of its golden age, modernizing the political system and introducing elements of civil rights, democracy, and the rule of law. In 2011, Andreas Oetker-Kast started working on the „Tamar, where are you?“ project and initiated the collaboration with the Georgian artists in 2016. The book, which was self-published in Germany, is available worldwide - and will be presented in Frankfurt at the main booth of Guest of Honor Georgia since the Georgian National Book Center supported its production. Discussion about the project will take place with Ana Kordzaia-Samadashvili, Andreas Oetker-Kast, and Dina Oganova. Since 1976, every year Frankfurt Book Fair has been choosing one country or region as its Guest of Honor. The status of the honorable country of Georgia was officially confirmed last year. The presentation of the book and project will take place on October 7 in Aarhus, Denmark.